Terrific weather yesterday for my trek to Gray's Harbor National Wildlife Refuge in Hoquiam, Washington. 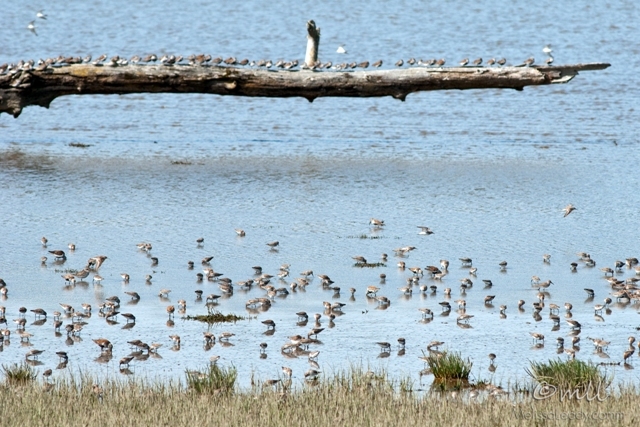 This is the time of year that shorebirds stop over on their migration up to northern Alaska, and I was curious to see this event. The park website suggests visiting during a four hour window surrounding high tide, and by the time I drove to the parking lot and then hiked a few miles to the viewing station it was exactly high tide. The shorebirds eat in the mud flats just above the tide level, so it turns out the high tide is sort of like the eye of the storm. There wasn't anything going on, just one mass of birds sitting on a large log that is partially visible in the background of the photo. After about an hour, the tide began to recede and tiny batches of these birds, mostly sandpiper and dunlin, started arriving and feeding along the shoreline. 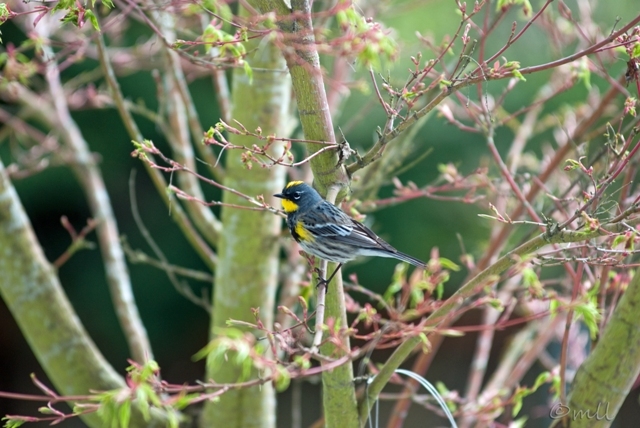 I was well out of my league here, both in bird identification ability and lens size, but I learned a lot from the birders and wildlife photographers on the viewing platform as we waited for the birds to arrive. Here's a broader view of part of the camas field at Lacamas Park. The entire "path" through the field happened to also be a small stream of water that leads to a waterfall a short distance from the field, so it's a muddy walk in the spring. I read a Lewis and Clark quote about how a camas field looks like a lake from the distance, and I agree, although I don't think I captured that illusion very well with my photo. The quote, which I'm recording second hand, appears to be from their time head back east in the Weippe (WEE-ipe) Prairie in Idaho. I'm including the reference info, although I can't personally validate it. the quawmash is now in blume at a Short distance it resemhles a lake of fine clear water, So complete is this deseption that on first Sight I could have Sworn it was water. 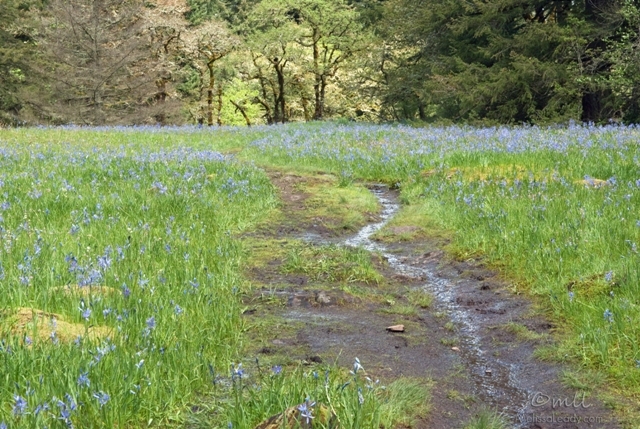 ..."
I first discovered a blue camas field back when we were living in Olympia, and it was a wonderful sight to come upon. 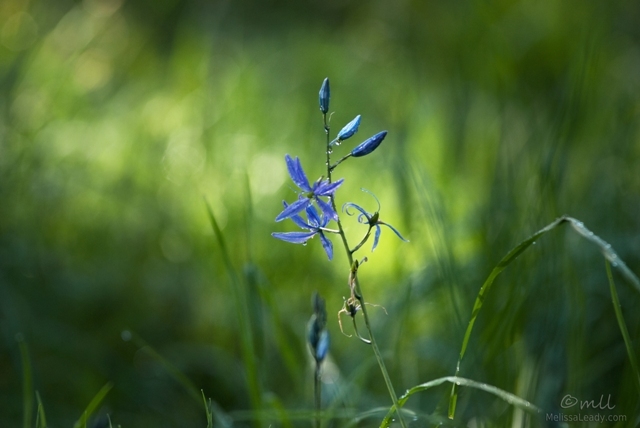 Camas is found throughout the region, and in fact the nearby town of Camas is named for this flower. This particular field in Lacamas Park is in bloom right now, and maybe through next week. I've tried to do some research on the plant, because it's historically relevant to the region. Camas was a Native American staple. 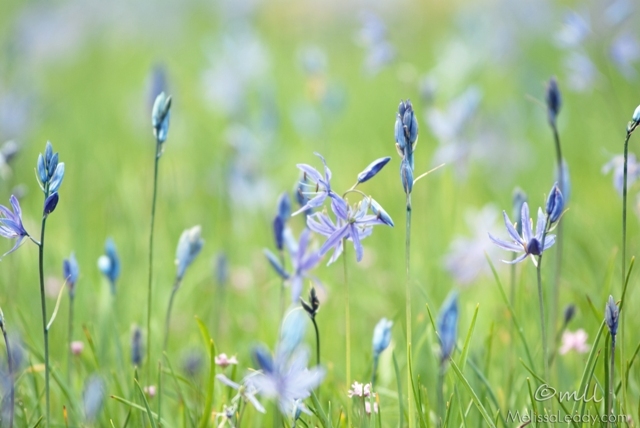 Called quamash by the native tribes here, it also goes by the names blue camas and camas lily, and is related to the hyacinth east of the Rockies. It has a bulb-like root, so I was imagining it to be something like an onion, especially with the purple flower, but from what I've read it is more like a potato. I've never seen it served around here though; the fields don't seem to be all that plentiful so people tread carefully through them during the few weeks that this beautiful flower is in bloom. The weather can change quickly around here, especially in the spring. 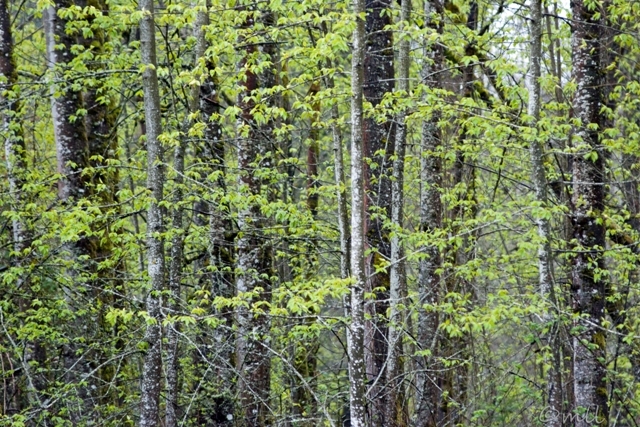 During my visit to Lacamas Park in Camas we got a light rain, then sunshine, then another light rain, and sun again. Rainbow weather, although I didn't see any. The weather here constantly amazes me. I've probably said this on the blog before, but in the Pacific Northwest we can get more weather patterns in a single day than we got in the Central Valley in an entire season! I thought this reflection pattern caught the weather changes pretty well. I went for my fastest shutter speed to freeze the little water droplet rings in the reflection. 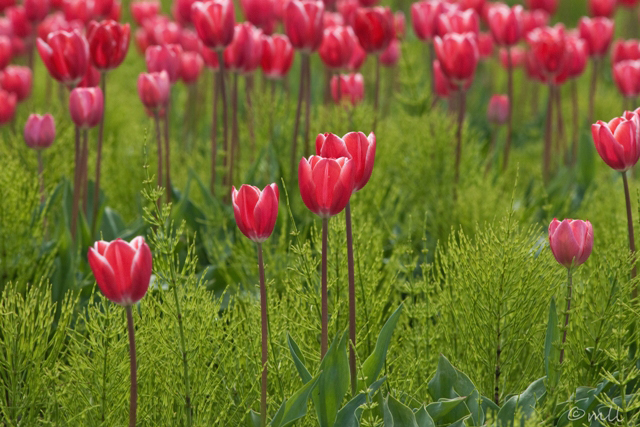 I'm not sure what that fern-like plant growing between these tulip rows is, but it made for an interesting photograph next to the rosy shade of tulip. I didn't fully realize this until I got home and viewed the photos on my computer or I would have spent more time here, oh well. 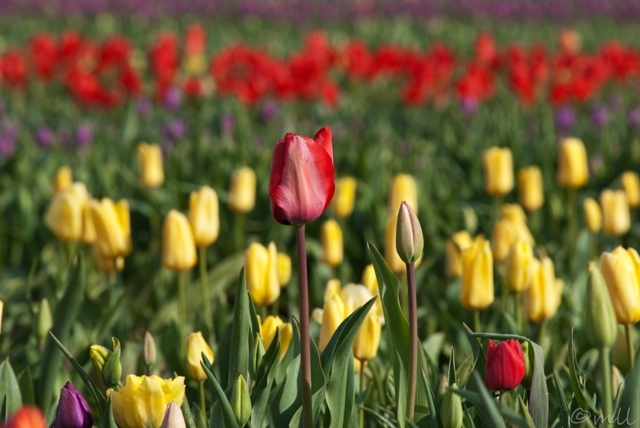 This should be the last tulip photo I'm posting this season...although I guess I'm not making any promises. 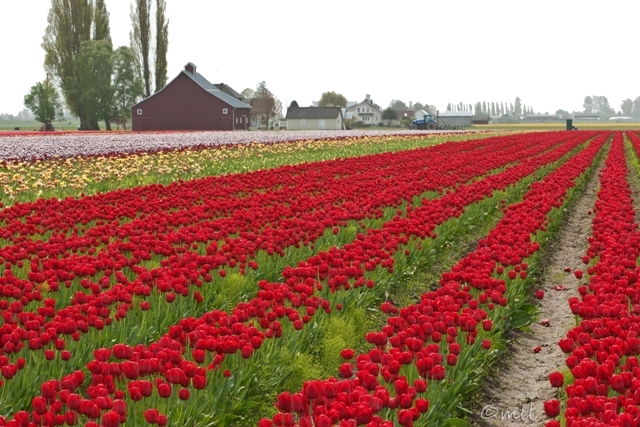 Also sorry that I forgot to record the tulip variety here. It appears in the two most recent posts as the thinnest layer of red at the edge of the field. Same field as yesterday, but from a different angle. 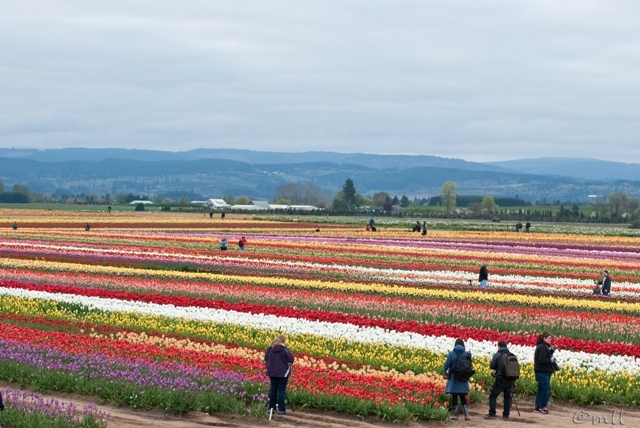 Yet another tulip field, this time from arguable the most famous tulip growing region in Washington, Skagit Valley. 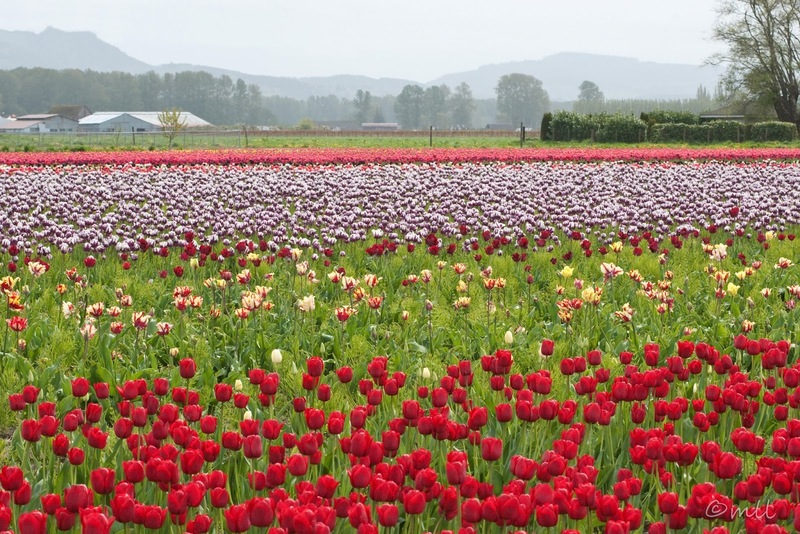 This area about an hour north of Seattle still has a large number of tulip farms, so people drive up here and either drive or bike a large tour route through the fields. We didn't have a lot of time to visit here, just a short excursion from a trip to Seattle. And I didn't anticipate how very crowded these country roads would be with cars. If I drive up here again next year, it will be on a weekday, and earlier in the morning. Probably the most vibrantly colored fields I've seen all year. Too bad for the hazy weather! As promised, a photo of my sunrise photo shoot. If only I'd looked in the starless sky before I departed I might have just slept in. But I didn't notice the overcast sky until I was almost at the field. I arrived at 6:20am, with sunrise coming at 6:32. I was surprised to find someone manning the parking booth at that early hour. There is a tulip festival going on this month, but they don't start charging for parking until 9am, long after photography time. Turns out there was a scheduled hot air balloon event, and the place was just crawling with photographers. I just had to laugh when I saw this scene. Best laid plans... I would estimate over 100 photographers in the entire field which I could probably capture if four or five photos. We were tripping over each other in this uninspiring light. I've been back from the Palouse for over a week now, and while I've been posting photos from my trip out there I was continuing the tulip field practice. This is probably my best photo from the week. This particular tulip variety is called Dordogne. 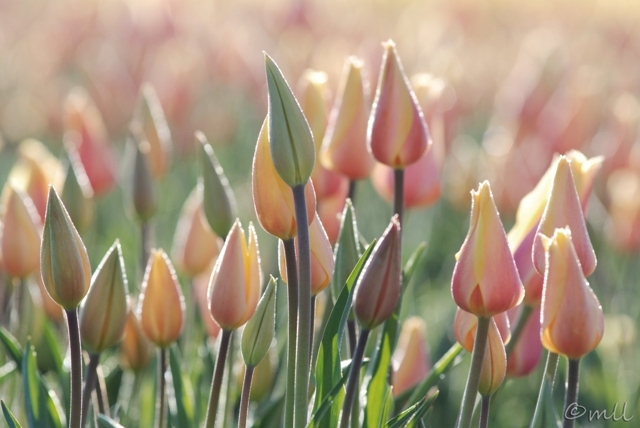 I like the morning dew, and unopened tulips, plus the colors are really soft. I arrived at the field about an hour after sunrise, which is sleeping in for morning photographers. There were several photographers there, just finishing up and probably chuckling at my late arrival. I feel like I would have liked the light better if I'd shown up an hour earlier. I did try arriving earlier later in the week, but it didn't go quite as planned. I'll post some photos of that particular trip over the weekend. The more abstract version. I was reading on the GreenWood Resources website this morning, and I was interested to learn that this particular tree farm in Boardman is part of a larger renewable tree farm industry. 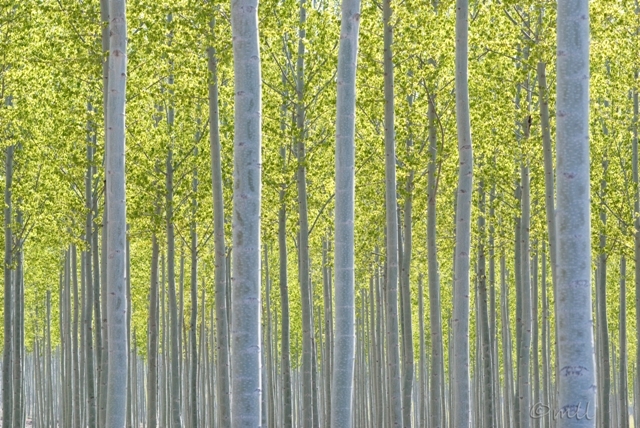 Headquartered in Portland, Oregon, they research and manage fast-growth hybrid Poplar farms throughout the US and internationally. A 21st Century crop. 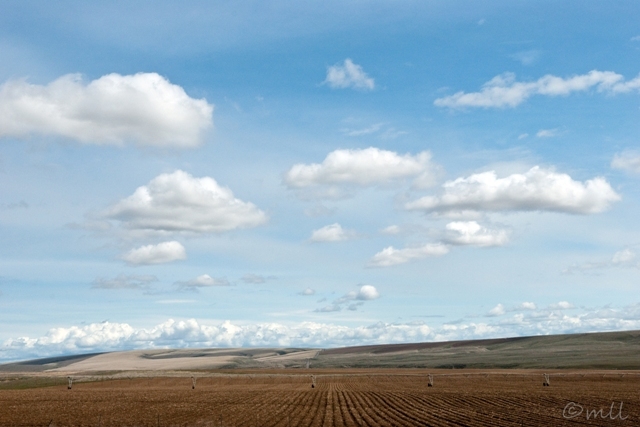 On our way home from the Palouse we happened to drive past this large field of Poplars planted in tight rows. The young leaves were glowing in the afternoon sun, in just the shade of spring green that I'd been admiring all month. I was pretty curious about these rows of trees so we got off the highway to check them out. 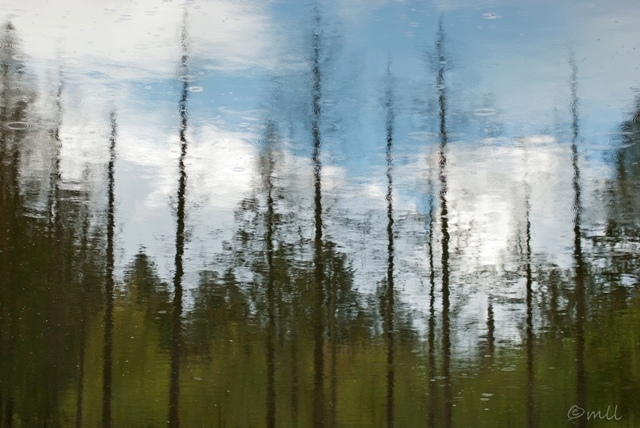 Turns out it's a sustainable tree farm growing high-yield, quick-growth trees for lumber and paper, creating biomass for energy production, and somehow treating wastewater through its irrigation process. The farm is called GreenWood Resources in Boardman, Oregon. Or maybe a better title would be Rows of Grain. 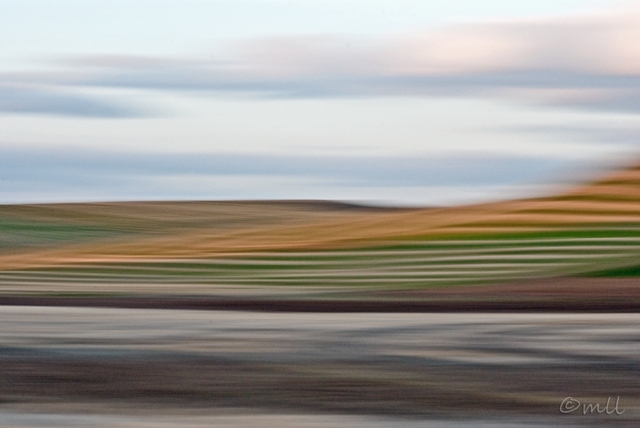 One of the interesting things about the Palouse was the row patterns cut into some of the hills by the farming vehicles. It's the same sort of pattern you see mowed into baseball fields. I know I've obscured it somewhat here with another panning shot, but it was really striking, especially in early April when the grain crops were just starting to grow. I think it will completely disappear soon as the crops really take off. It came out really strong in this photo though, which was taken just a few minutes before sunset on April 6th. Here's a good Palouse example of the freshly planted grain next to the unplanted rows. 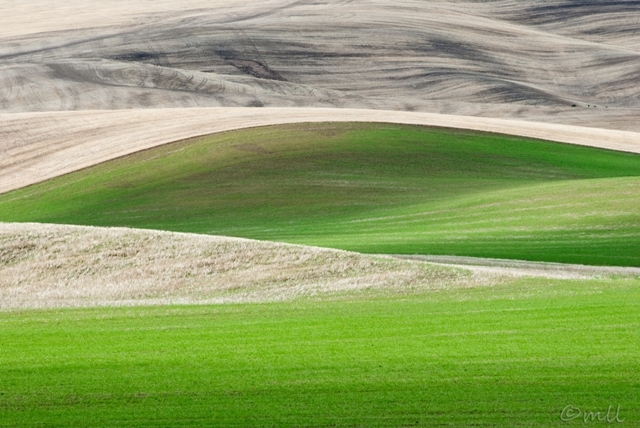 The Palouse is a large agricultural area in the southeastern part of Washington and western part of Idaho. It was originally a rolling prairie, but settlers converted the area to productive grain and legume fields in the late 1800s. I read that this area of Washington was the most populous area of the state then, which is why it became home to Washington State University in Pullman, and the University of Idaho six miles to the east in Moscow, Idaho. And even though the region is no longer a population hub for Washington, it remains an agricultural center, growing 97% of all US grown lentils. In fact while we were here, we saw signs for the upcoming Lentil Festival! The crops don't need irrigation, and I'm not sure why that is, because they get very little rain here compared to western Washington. We got here a little early in the season for photography; by late May this entire region will be a rolling blanket of vivid green (wheat, lentils, etc.) and yellow (canola, wild mustard). I'm already planning my photography trip back here during this colorful season. 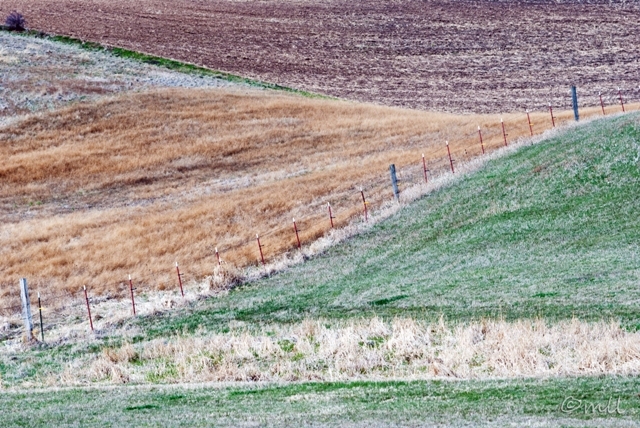 Here, the green hills are freshly planted, and the majority of the brown hills have been plowed. 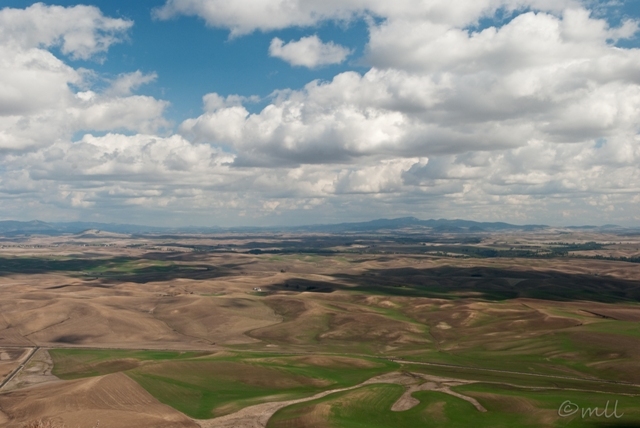 This particular photo was taken from the top of Steptoe Butte, elev. 3612 ft, and I thought this was a good "overview" photo to introduce the region. The hills look tiny from up here, but they're pretty large. And those puffy clouds hung around the whole weekend we were here. 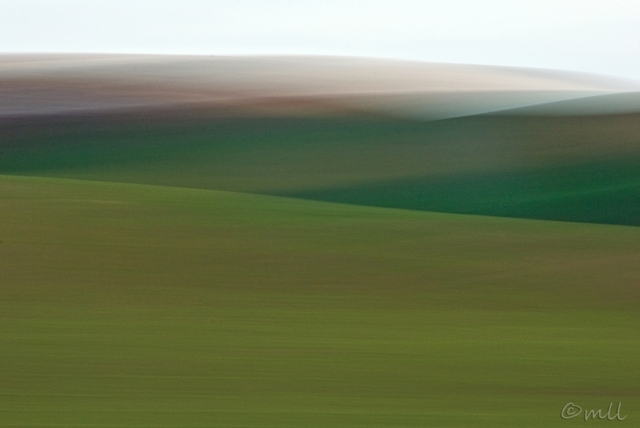 The Palouse is a windy place, and the clouds move over the hills pretty quickly, so the hills were always coming in and out of shadow, which added extra to the interesting curves of the land. The Cascade Mountains, and the Columbia River Gorge cutting through them, create two very different ecosystems to their east and west. 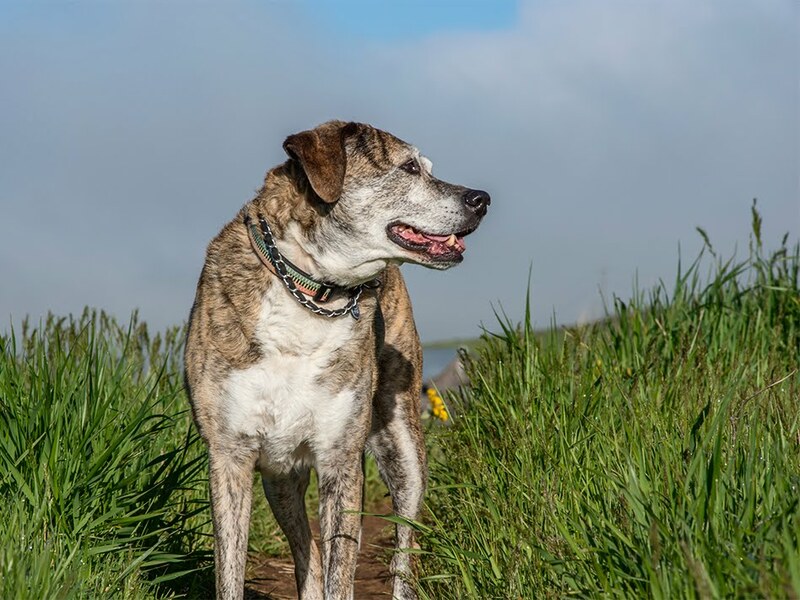 Photos from the last three days were all taken within several hours of each other, and show the transition of both terrain and weather as you pass from Western Washington through the Columbia River Gorge and into Eastern Washington. This is what most of the eastern part of the state looks like, rolling hills, grasslands and farm fields. We had a six hour drive to our destination of Pullman, Washington which is in the southeast corner of Washington along the Idaho border, so I didn't have a lot of time to stop and take photos. But these clouds and fields kept mocking me until I couldn't take it any more. I pulled over along the side of a desolate exit ramp and took this photo, which gave me a little elevation over the scene. I ended up liking it a lot better than I thought I would, I think because it seems to have a lot of depth to it. 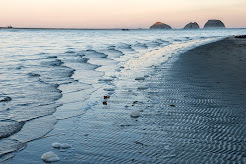 In terms of photography, I have a choice between two lenses, my 17-55mm (wide angle lens) and my 80-200mm (zoom lens). I almost always choose the zoom lens because it lets me focus in on an interesting pattern or shape, and I like to abstract a scene that way. I'm much less comfortable with my wide angle lens. I know I'm supposed to have foreground, middle ground and background, and I really struggle with capturing all that; somehow it's just too much to put together for me. This photo is lacking foreground. I can't remember what was along the side of the road that I could have used as foreground, but I remember thinking that it wouldn't work. So I left it out completely, which should make the scene seem much flatter, but the clouds and field rows do give it a lot of depth, so it came out a lot more interesting than I was expecting. It's a beautiful drive east along the Columbia River, and an easy way through the Cascade Mountains. As the Ice Age ended and glaciers melted, the Columbia River cut through the Cascades, so driving along this river gorge doesn't have the same challenges as crossing one of the mountain passes. It's a pleasant sea-level route through the mountains. Along this stretch the river forms the boundary line between Washington and Oregon. I realize now that I didn't take any photos of the river itself, so I'll have to put that on my list for future photos. One of the things that kept catching my eye as we drove along was the way the hills wrinkled toward the river on the Washington side. 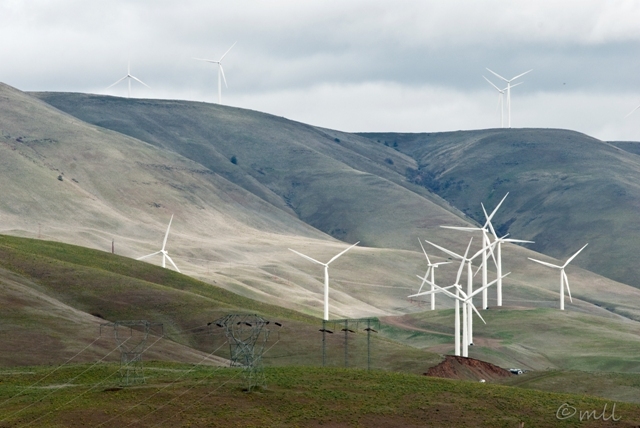 We crossed back over into Washington to visit a museum in Maryhill; these wrinkled hills and wind turbines were just beyond the museum. The gorge is usually a very windy place, so it's a good spot for these wind turbines, although I think they must collect a fraction of the energy harnessed at the dams along this stretch of the Columbia. We headed to Eastern Washington on Saturday, and that means crossing into Oregon to drive along I-84, which is a much faster road than the one on the Washington side. I'd have to be in an awful hurry not to stop at Multnomah Falls driving on 84, and in this terrific drizzle and fog, there was no way I wasn't stopping; the view was just too interesting to pass up. 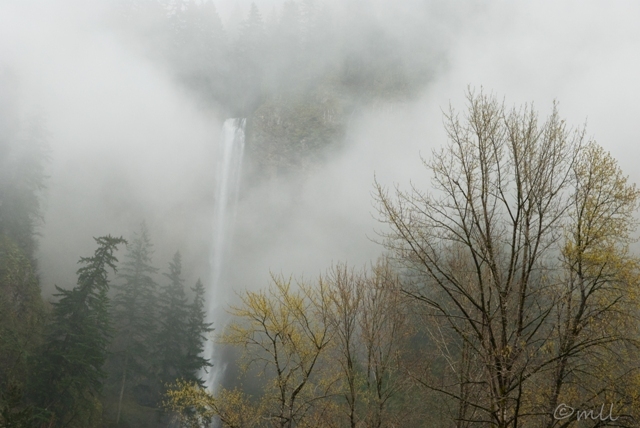 When we approached by car, the fog was so thick at the top of the falls that it looked like they fell straight from the clouds. By the time we parked and I got my camera out the fog had shifted. This was that first photo, taken from the parking lot. I've been noticing this great fresh shade of green on trees around here, usually while I'm driving in my car and thinking I wish I had time for a photo. This was a quick attempt to capture it the other day. I really need to remember to work on some photos of these chartreuse leaves next year; this is the second year of mainly just thinking about it while I'm driving. 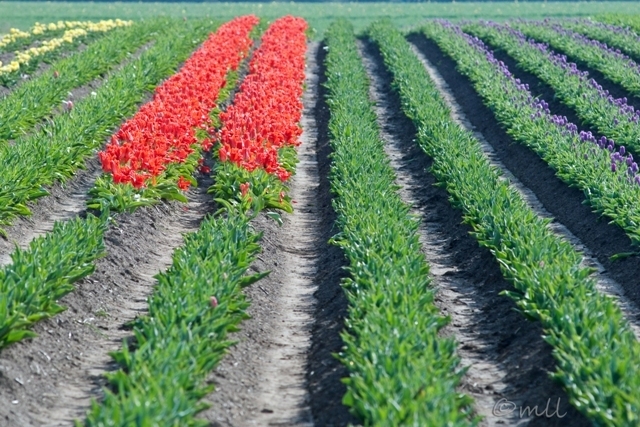 From my sunny day shoot at Wooden Shoe Tulip Farm in Oregon. It gives a sense of how the field was looking back on March 24th. I'll return here next week and post some new photos of the field for an update. I haven't had a chance to get out with my camera in the last few days, but this morning I looked through my SD card in preparation for a trip I'm taking this weekend, and decided to post a few more photos from my trip to Woodburn last week. My main issue with all the photos I took that day was that the light was pretty harsh, but I'm liking this one especially today. I'll post a few more over the weekend, and should hopefully have some new scenery to post next week once I get back.